The author argues that new technology allows power to shift from the public to the private sector - and even down to the individual - is provocative and prophetic. It is not just a change in how we computer or communicate. Rather, it is a potentially radical shift in who is in control - of information, experience, and resources. explains how new technology is allowing individuals to take power form large institutions such as government, corporations, and the media. Gutenberg's 15th century printing press became available, individuals could for the first time begin to exercise real discretion over their information intake and their beliefs. As printing method improved in 17th and 18th centuries, books circulated more widely, and literacy and education blossomed. The scientific advances of Copernicus, Galileo, and Newton became widely known. The Enlightenment philosophies of writers like Locke, Rousseau, and Paine found an audience. In 19th and 20th centuries, the advent of mass media - the rotary press, penny papers, photography, film, radio, television- helped to pull together increasingly large communities and to spur cohesive modern nation-states. > Top What they suggest is a potentially momentous transfer of power from large institutions to individuals. The real change set in motion by the Internet may, in fact, be a control revolution, a vast transformation in who governs information, experience, and resources. Hierarchies are coming undone. Gatekeepers are being bypassed. Power is devolving down to "end users." "Individuals are acquiring more control over their lives, their minds and their bodies, even their genes," says New York Times. > Top Contrary to the common pronouncements that the Internet is "inherently democratic," then, this technology is not automatically a guarantor of liberty or fairness. Indeed, code may be at the heart of various power struggles in the digital age. First, characterized by many-to-many interactivity. It allows individuals to be creators of content rather than just passive recipients. Second, content on the Net is digital, which means flexible in terms of how it can be stored, used, and manipulated. Third, the Net is distributed, packet-based network, rather than a circuit-switched network. This increased the network's efficiency and the ability of users to route around censorship. Fourth, the Net is interoperable, which is open to all comers; its basic protocol of information exchange, TCP/IP is nonproprietary, not owned by anyone. Fifth, the Net should be broadband; a variety of information - text, audio, video - can be transmitted via a single pipe. Sixth, the Net must be universal. Universal access requires that all individuals have some meaningful access to the Net. US Telecom Act of 1996 represented a major step to deregulatory direction; and-off policy for cyberspace, refrain from taxing like a global free-trade zone. The Internet origins were primarily in facilitating research, not in allowing US communication system to survive a Soviet nuclear attack. Soon the researchers began using the network (Arpanet) more to exchange email than to share data and computing power. In mid-1990s, the Internet became more commercial, the federal government began to withdraw from funding and overseeing it. The control revolution represents the merger of the communications revolution and the free-market revolution. From 1960s to 90s Americans' confidence in government has fallen precipitously. 3/4 in 1964 trusted the federal government, now only a quarter say this. > Top European authors now write of "the new era of personal sovereignty" and the age of "the sovereign individual." "User^friendly" was the term that evolved to describe this new computer interface. Brilliant TV advertisement introducing Macintosh, only once, in Jan. 1984 during the Super Bowl; a young woman liberated a horde of downtrodden info-age serfs from the gray, sterile tyranny of Big Brother - in this case, not the intrusive state of Orwell's 1984, but Apple powerful and lumbering rival, IBM. > Top Now, with the reach and flexibility of the Internet, we can extend that power outward; from the tidy, inward focus of managing our files and applications to an increasingly externalized control - a remote control - of our interactions with the information and inhabitants of the whole world. shows how powerful entities are trying to limit our new digitally enabled autonomy. It is not an easy time to be a state. Approval ratings are down. Budget are tight. Competition is global. Computers and the Internet present them with opportunities to enhance their power through activities such as automation and surveillance. Yet these also forcing them to deal with many novel challenges. Not all of these have to do with individual control. The ability of rival nations or terrorist groups to use the Net to launch a crippling attack on a government's information infrastructure. Less apparent and potentially more important is the fact that individuals are acquiring abilities that neither they nor the state fully understand yet. Thus, even when government legitimately seeks to act in the public interest, it may wind up unjustly limiting the individual autonomy that technology allows. Unfortunately, many nations of the world have only contempt for these words and for the larger principle of freedom of expression, association, and thought that they represent. CDA made it a felony, punishable by a fine and put to two years in prison, to knowingly transmit "indecent" messages to anyone under 18 years of age....."
The legal problems with this scheme, as Supreme Court recognized, were numerous. For one, the wording of CDA was so vague and overbroad. Additionally the stature's safe-harbor provision was unworkable. In attempting to protect kids, then, CDA would put a frigid chill on free speech, vastly restricting the materials available to adults. Human-right workers and Health-care professionals rely on encryption to transmit sensitive information. Also it allows to ensure that information has not been tampered with and to authenticate their identity through digital signature. It further facilitates commerce by permitting credit-card purchases to be made securely online and by allowing vendors worldwide to exchange payments securely. Alice can therefore encrypt a message with Bob's public key and know that only Bob can unscramble it. And if Alice encrypts the message with her private key, Bob can use her public key to authenticate that the message came from her. The string of numbers in each key has gotten longer; from 40 bits to 128 bits for PGP (Pretty Good Privacy) encryption. This changes the balance of power between individuals and the state. It allows us to keep secrets from government. Copyright rests on a delicate balance of interests. The goal of this exclusive right is to give creative people a financial incentive to produce art, further science. Copyright establishes a careful equilibrium between the rights of owners and the right of users. The Net seems to be a gigantic copying machine. WIPO (World Intellectual Property Organization), where a copyright treaty was being renegotiated, but came up largely empty-handed. Microsoft's campaign (1995): "Where do you want to go today?" It is perhaps the perfect catchphrase for the control revolution, embodying the new, technologically enabled exaltation of individual will and unfettered choice. "Netscape.com The world according to you." "I am superman and I can do anything." "Have you ever sent a fax from the bench? ""Have you ever installed a phone on your wrist?" The control revolution, after all, presumes the ability of individuals to make choices for themselves about information, experience, and resources. Attorney General Janet Reno asserted that MS was unfairly using its dominance in the PC market to obtain a commanding position on the Internet. Java: a platform independent language developed by Sun Microsystems. Network computers by Oracle, etc. - cheap and fairly unsophisticated terminals. Yahoo, Exite, etc. added news, free email service, chat rooms, stock quotes, and games; they are called portal sites rather than search engines. They want users to stay, not go. WebTV: introduced in 1996 and purchased by MS in 1997. WebTV sales pitch unabashedly invites the user to be a couch potato. "Oversteer": the tendency of an automobile to steer into a sharper turn than the driver intends sometimes with a thrusting of the rear to the outside. warns that individual control can be pushed too far. Enthralled with the idea of taking power from politicians, media giants, and price-inflating middlemen, we may lose sight of the benefits of representative democracy and of the need for intermediaries who bring us reliable news and high-quality products and services. 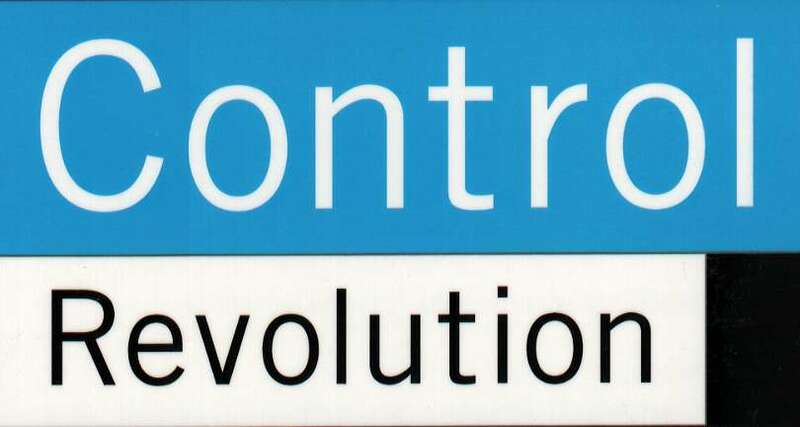 This is one of the major components of the control revolution. Faced with a deluge of sensory stimuli, we must filter and select just so we can deal with what would otherwise be an overwhelming tidal wave of data. Ignorance and narrow-mindedness are hidden dangers of the control revolution. Human consciousness has always been characterized by some degree of filtration. From an evolutionary perspective, this is an advantageous trait. Each person could see those things that he wanted to see. the ability to exercise nearly absolute personal control over experience by digital technology. email program automatically delete messages from certain people. sheds interesting light on how we choose what we see and hear, and with whom we interact. We all have a desire to produce consistency in our lives. As our minds process different thoughts and stimuli, we want to experience these competing messages in a way that promotes consonance and harmony rather than dissonance. Because of fear of dissonance, circumspect behavior is observed with regard to new information even when little or no dissonance is present to start with. Our decisionmaking may be shaped by our unconscious desire to resolve contradictions and reduce psychological discomfort. Information is selectively forgotten or displaced in order to avoid painful associations. We seek out that we already know about. We are inclined to track the ideas, information to which we have already committed. Customizing our lives to the hilt would dull our senses and our imagination. "Pervasive" or "ubiquitous" computing will increasingly be a lens through which we experience the world. The more I learned about those subjects, the more interested in them I became. The interactivity of the Net speeds up and streamline the feedback process. If personalization is pushed too fat, our communal conversation will be cut up into an endless number of isolated exchanges. We would lose our "agora in the media." It would be difficult, maybe even impossible, for citizens to establish common ground, solve problems, and discover compassion for one another. Freedom of expression includes a kind of unspoken compromise between the unpopular speaker and the reluctant listener. The opportunity for one citizen to confront another is important not just for the sake of the speaker. It is fundamental to the idea that in a democracy "debate on public issues should be uninhibited, robust, and wide-open." In the digital context, things are different. Though the Net empowers us as speakers, it empowers us as listeners even more. We need never be "captives" subject to speech we don't want to hear. We cannot make informed decisions about social and political issues unless we are exposed to a wide range of views. This includes some speech that we might not initially want to know about. Extreme disintermediation of our information environment means that responsibility for determining truth rest as much with those who consume information as with those who produce it. It represents a clear transfer in power over one of our most important social functions; who distinguishes fact from fiction and ultimately determines what is true. Increasingly, we bear that burden. Another danger is that due to the novelty of the Net we may not yet have developed a sophisticated eye for judging the veracity of online information. A state securities regulator calls day trading"sophisticated slot machine." Outside the financial markets, the risks to individuals of bypassing middlemen may seem smaller, but again consumers have to be careful about how much disintermediation is too much. Even if absolute prices were lower than those found offline, higher search and transaction costs would offset that advantage. At a certain point, disintermediation would be more of a hassle than it was worth. The low voter turnout that has characterized American politics in recent decades suggests that our republic is a democracy in name only. Presidents are often elected and congressional majorities are routinely determined by the votes of a quarter or less of all eligible voters. Democracy would, therefore, be well served by individuals using the Net to increase their participation in political life. Water Lippmann, journalist, pithily summarized the conundrum of representative democracy. "A mass cannot govern." But now we seem poised to test that maxim. Traditionally, we have relied on them to act as our agents, using their training, experience, time, and judgment to determine social needs and to allocate resources. We could become not just citizens, but citizen-governors - each of us playing a role in governing the distribution of resources, the wielding of state power, and the protection of rights. The growth of networked computing has allowed data compilers, direct marketers, and list-sellers to gather and sell personal information about practically everyone. A report (Apr. 1997) by a presidential advisory panel mentioned "the intriguing possibility that privacy could emerge as a market commodity in the Information Age." The goal of these endeavors is to give individuals more control over personal information, rather than having control be entrusted to government regulation or even industry self-regulation. Like most legal privileges, privacy is not an absolute. It must occasionally yield to other individual right such as free speech and public accountability. Privacy protection is a higher priority in EU than in US. In Oct.1998, EU implemented a strict directive limiting the collection and distribution of personal data. EU is urging US government and business to beef up their lax privacy standards. charts a path between this Scylla and Charybdis. It describes how we can reap the benefits of the new control without succumbing either to resistance or to excess. We should borrow from time-tested arrangements to achieve efficient and just results in a different set of circumstances. This generally means taking the principles that underlie existing laws and rules and mapping them to fit a new context. Some modification may be necessary. But generally, this approach will be more effective than either rigidly applying old rules or coming up with entirely new ones. In US, the constitutional principle is fairly clear: Materials that a community deems inappropriate for minors may lawfully be kept from children so long as the free speech rights of adults are restricted as little as possible and parents retain the right to override the community's judgment with regard to their own kids. Public libraries routinely help parents to choose suitable materials by publishing lists of suggested books for different age groups. The principle at stake is also one of constitutional dimensions; How do we encourage and reward the creation of original works while at the same time allowing the public to benefit from those creations? The remedy to this situation lies in modifying the new rules of information protection to allow for some of the breathing room that has always been a part of copyright law; to preserve the ability of individuals to copy and otherwise use a work for a few socially beneficial purposes - parody, commentary, personal use. Open-source software, also known as freeware, is generally developed voluntarily by programmers and distributed for free. It's called open source because the underlying source code, which usually is proprietary, is made freely available. > Top We may have what psychologists call "outcome control" but not "agenda control." That is, we may possess control over specific short-term outcomes - should I click x or y? - but no control over the broader agenda of what the Net is about; whether it is diverse or monochromatic, dominated by a few companies or open to robust competition, trivial or enlightening. Delegating power to trusted intermediaries will make us more free. Political representatives, news professionals, and commercial middlemen can make awful decisions on our behalf - but we're generally better off with them than without them. The more that people are empowered by technology, the more effectively they should be able to parcel out duties, since they will have a broader range of candidates to choose from. We should not, however, delegate and then micromanage our appointees. Rather, we should select them with great care and then regularly review their performance, while otherwise allowing them to exercise their own judgment. Appealing as the unmediated interactions of"friction-free capitalism" may be in theory. Randomness, serendipity, and surprise can account for some of the most pleasing aspects of life. The control revolution reflects and reinforces this. We are becoming so accustomed to plotting our experience - what information we'll receive and what we'll filter out. With thousands of channels to choose from, "surfing" aimlessly will probably be less and less common. Rather, we will use sophisticated search-engine and agent technology to find just the content we want. Personalization can help us in a variety of ways - to gain specialized knowledge, to explore our idiosyncratic desires, or just to clear a path through the data smog. Schools and universities have a special role to play in seeing to it that citizens in the digital age do not fall into the trap of using individual control to indulge only their own interests. Open mind is the foundation of a liberal education. "This university has been committed to offering an encounter with difference as part of its educational mission", says Levin of Yale Univ. Home-based "distant learning" online could become a popular alternative to traditional schooling for reasons of cost and convenience. Because an online curriculum can easily be customized to the desires of parents and their kids. Indeed, it is likely that those groups that oppose encounters with different most would be the first ones to choose distance learning over traditional schools. We must recognize, for selfish and societal reasons alike, the importance of focusing on the local. For most of us, this is where we will find a true sense of belonging; shared experience, even if not ideal, creates a sense of commitment. For all of us, this is where democracy and social justice must first be achieved. Opportunities for face-to-face interaction seem, in fact, to be another essential component of successful online communities. Liberty and progress would be best secured if government did not regulate communications technology; new media would foster freedom, as books had for centuries, if the state just left them alone. For the sake of democracy, we need to forge a new social compact - not a starry-eyed declaration of cyber-independence, but a realistic compromise between personal liberty and communal obligation. Government has a role to play, but increasingly individuals will have to balance their new power with new responsibilities to society at large. We must resist the urge to use technology to disengage from reality and its problems, using it instead to strengthen local communities and public discourse. Democracy may flourish in the era of individual control, but only if each of us makes the requisite sacrifices. I recognized the appearance of the cover of this book is that of Macintosh, with pulldown menu describing "How Internet is putting individuals in charge and changing the world we know." This book is recommended by Prof. Kumon of Glocom to understand latest Internet Age from the viewpoint of a netizen.